It’s been a long summer without hockey, but now we have finally reached autumn and opening night for the NHL. Every team starts off with a clean slate and with the hope to hoist the Stanley Cup next June. More realistically though, some teams are stronger than others and thus have a better shot at the Cup. One team in particular stuck out and struck a chord with me and is my favorite to win the 2015 Stanley Cup. Yes, the Tampa Bay Lightning. With all the talk about the Boston Bruins being the favorite in the Eastern Confference, so many people forget about the Lightning, but they really shouldn’t. The Lightning have a well balanced team with great young talent and rock solid goaltending, a perfect recipe for making a run in the postseason. This season, the Lightning will have Stamkos for a full season after breaking his leg in a game against Boston early last season. Last season, the Lightning could have very easily given the Bruins a run for their money for the Presidents’ Trophy had they had Steven Stamkos for the full season. 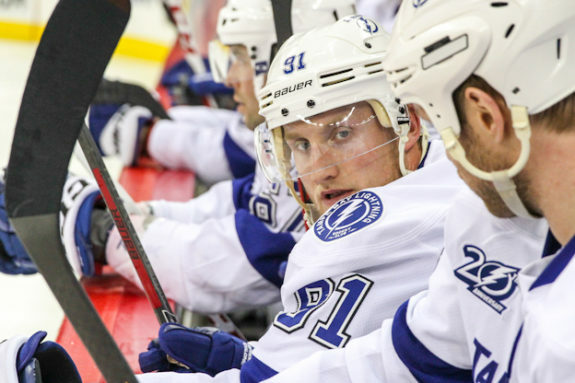 Stamkos is healthy and ready to wreak havoc in the NHL. Stamkos will have a great season and will win the Rocket Richard Award for top goal scorer. 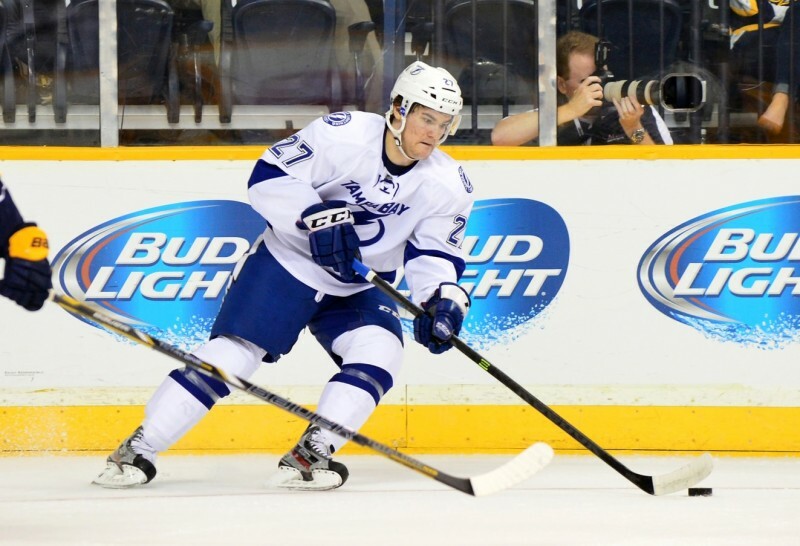 Tampa’s top prospect, Jonathan Drouin, appears to finally be ready to make his NHL debut. Although Drouin is battling a thumb injury and will not be ready to play in the Lightning’s opener against Florida, he will be a huge asset for the Lightning. The Lightning already have a young and talented team, but the addition of Drouin could put the Bolts over the top. Although Drouin was drafted the same season as Nathan MacKinnon, Drouin spent all of last season in the juniors with the QMJHL’s Halifax Mooseheads. The Lightning know exactly what they are doing with Drouin: not rushing him. Tampa sent Drouin to the juniors for more seasoning and he came back a better player and with better numbers. Drouin recorded a career high in assists (79), points (108), playoff assists (28), and playoff points (41). Drouin is ready, plain and simple, and is a favorite to win the Calder Trophy for top rookie. John Gibson in Anaheim could challenge Drouin for the Calder, but ultimately it goes to Drouin in the end. 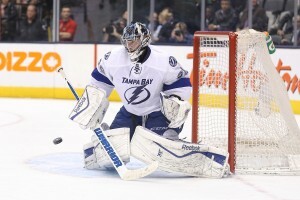 The goaltending could not be more solid for the Bolts. Tampa arguably has one of the best goaltending tandems in the league with Ben Bishop and backup Evgeni Nabokov. 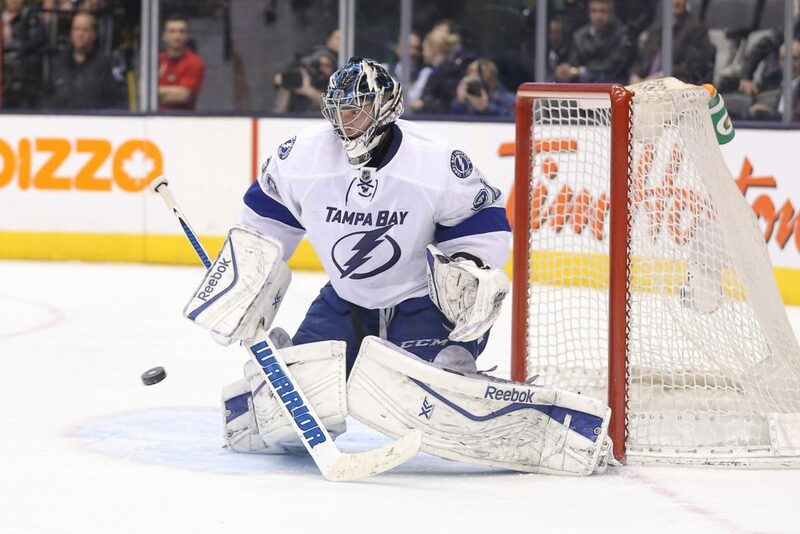 Last season’s backup, Anders Lindback, is playing in Dallas this season and the addition of Nabokov gives the Lightning a reliable goaltender that could come in and solidly handle the crease and give Bishop some much needed rest. Lindback was not very good for the Bolts last season, posting a losing record and a save percentage of just 89%, a career low, and looked completely out of place against Montreal in the playoffs last season. Bishop suffered an injury towards the end of last season and did not play a single game in the playoffs as the Lightning were swept out of the playoffs by the Montreal Canadiens. You would have to think with someone like Nabokov instead of Lindback, the Bolts would have fared better against Montreal. Although Nabokov may be getting old, he can still get the job done. Nabokov posted a winning record during his three season with the Islanders, no small feat, and, although his save percentage was just slightly better than Lindback’s last season, he gives the Bolts a lot of experience and someone who has had a lot of playoff experience, just in case Bishop gets injured again. Speaking of Bishop, if Bishop can stay healthy, the Lightning will indeed make a run. Bishop has established himself as a top flight goalie in the NHL and in the playoffs, goaltending is everything. With Tampa having a great offense and great goaltending in Bishop behind them, the sky is the limit for the Lightning and come June they will indeed hoist the Stanley Cup for the first time since 2004. A lot of people and pundits think the Bruins will represent the East in the Stanley Cup Final, but I just don’t see that as the case. The Bruins defense became considerably weaker when they dealt Johnny Boychuk to the New York Islanders, they lost Jarome Iginla and Shawn Thornton and didn’t really get anyone to replace them. The Bruins will have trouble generating offense this season, mark my words. The Bruins may still have Tuukka Rask in net, and they will always be a threat because of that, but the Lightning have a more balanced team than the Bruins. So, there you have it, the 2015 Stanley Cup Champions will be the Tampa Bay Lightning with captain Steven Stamkos lifting the Cup proudly over his head.